Members of the University of Maine men's hockey team gather for a celebration photo on Dec. 29, 2012, after winning the Florida College Classic in Estero, Fla. The University of Maine men’s hockey team’s 14-year affiliation with the Florida College Classic in Estero, Fla., has come to an end because UMaine is adding nonconference games against New Hampshire and is trying to save travel costs. He said the timing of the tournament, which is held during the Christmas holidays (Dec. 28-29 this past season), was problematic and they also wanted to make room on their schedule for their nonconference games against archrival New Hampshire at the Verizon Wireless Arena in Manchester, N.H., and Portland’s Cumberland County Civic Center. Those games will begin next season and will be in addition to the Hockey East games that will be played at the Whittemore Center in Durham, N.H., and the Alfond Arena in Orono every year. Gendron said next season’s Manchester-Portland games will be played back-to-back on Dec. 12-13. However, he indicated that they won’t be held on back-to-back days in the future. “It was a tough decision,” said UMaine interim athletic director Seth Woodcock. “But these games against UNH in Portland and Manchester were a great opportunity for us. It will give our fans and alumni in the southern part of the state a chance to see the team as well as the ones in Manchester. Woodcock said the trips to Florida for the tournament cost the school money even though some of the expenses were covered by the sponsors. The nonconference games with New Hampshire should make money for the schools, he said. Woodcock pointed out that it is a “long season” and to have a tournament in Florida right after Christmas deprived the coaching staff and players of valuable family time and a useful relaxation period. Players, coaches and other hockey personnel would have to leave on Christmas night or the day after Christmas to return to campus or make their way to Estero, Fla., on their own. But he also called it a top-notch tournament and a useful fundraising tool because there are several Maine alums living in the Estero, Naples, Fort Myers area. “But we’ll still be going down there for fundraising,” he said. Maine and Cornell have been the host schools for the tourney. The tournament has been held at Germain Arena, home of the Florida Everblades of the ECHL. The Black Bears won the tournament six times and were runners-up three more times. They finished with an overall record of 16-8-4. Maine lost in a shootout, 2-1, to Cornell in this past year’s championship game. 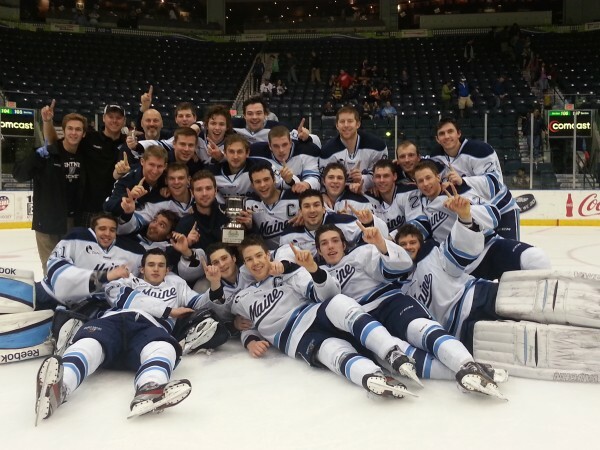 Maine was seeking its third consecutive tourney title. Brush added that he would like to see UMaine come back and play in the tournament again some time. “A lot of their [former] players have played for us and I’m sure there will be more,” said Brush.